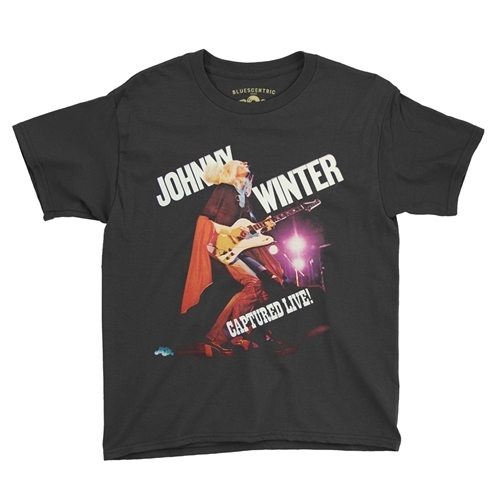 Every sale of this official Johnny Winter Captured Live Children's T Shirt benefits Johnny Winter's estate. Winter's live album Captured Live! was released in March of 1976 and included Winter's searing cover of Bob Dylan's Highway 61 Revisited. The album was recorded mid-September, 1975 at the Swing Auditorium in San Bernadino, California and released on Winter's own Blue Sky Records. This shirt also features Blue Sky Records' logo in the bottom left corner. This Bluescentric Brand children and toddler's Johnny Winter t-shirt is available in premium lightweight 4.2oz Toddler sizes T2-T5 and Youth Small through XL. Solid colors are 100% airlume combed and ringspun cotton. Athletic Heather is 90% cotton.